Be the first to share your favorite memory, photo or story of Leota. This memorial page is dedicated for family, friends and future generations to celebrate the life of their loved one. 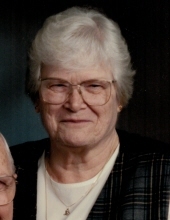 Leota Maxine (Ulrich) Wacht, age 91, passed away on Sunday, January 27, 2019 at Valley Vue Care Center in Armstrong, Iowa. A graveside service will be held at 10:30 AM Thursday, April 4, 2019, at East Linn Cemetery Redfield, Iowa. Leota was born in Adel, Iowa in 1927, and graduated from Redfield High School in 1945. She lived most of her life in Urbandale. She was member of the Redfield girls’ basketball team that participated in the 1944 Girls’ State Basketball Tournament held at the Drake Field House in Des Moines. Leota retired from the Urbandale Community School district in 1989, after 15 years, where she worked in the school lunch program. She enjoyed spending time with her family especially during yearly vacations at the lake. She spent the early part of her retirement traveling with her husband Robert visiting various parts of the country and seeing extended family. She was a long member of the Women’s Legion Auxiliary in Redfield. Leota’s pastimes included gardening, working on puzzles, spending time outdoors enjoying the birds and her flowers. She is survived by her three sons Bob (Jeanie) Wacht of Johnston, Ted Wacht of Armstrong, and Bill (Connie) Wacht of Des Moines; her daughter Janet Wacht of Armstrong; her four grandchildren: Lori (Mike) Wilcox of Johnston, Tod Wacht of Des Moines, Troy (Sarah) Wacht of Des Moines, and Dillion McBride of Johnston; and her five great-grandchildren. Leota is also survived by her three sisters Martha Hill of Stuart, Velma Cummins of Dallas Center, and JoAnna Lynn of Sun City, Arizona. She was preceded in death by her husband of 59 years, Robert Wacht; her granddaughter Julie Ann Wacht; and her three brothers Richard Ulrich, Fred Ulrich, and Frank Ulrich. To send flowers or a remembrance gift to the family of Leota Wacht, please visit our Tribute Store. "Email Address" would like to share the life celebration of Leota Wacht. Click on the "link" to go to share a favorite memory or leave a condolence message for the family.